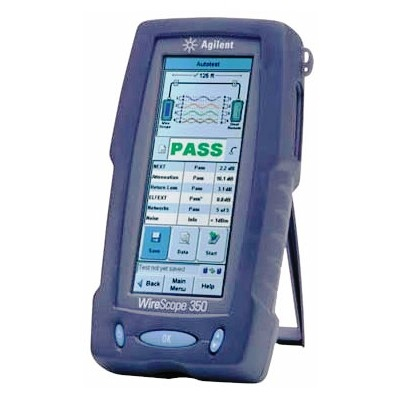 The Agilent N2600A also known as the WireScope 350 is a popular Hand Held Tester and network cable analyzer which has a brilliant color touch screen and offers outstanding testing performance. Popular with cabling technicians, this device is basically used to certify Fiber and also Cat5, Cat5e , and Cat6 cabling installations with Agilent Single Mode and Multi Mode Smartprobe modules. It is very user friendly and provides extraordinary reporting and precision test abilities. Users tell us that the quick operation and simple navigation features offered by the color touch screen make learning how to use the unit a pleasurable experience. You can assimilate test information, set up testing screens and configure testing options quite easily, all while reducing the odds of inadvertent tests to incorrect limits. Smart design means dramatically reduced process times using defined settings via PC when configuring multiple Wirescope 350 sets for same job site tests. Also included in the Agilent Wirescope 350’s impressive feature set is its superlative measurement performance. The design is based on the same frequency domain test technology currently in use on the industries most precise Network Analyzer models. Technologically advanced software, including Enhanced Auto Cancellation, is combined with unparalleled precision hardware which automatically leaves it free of undesirable interface and adapter effects. The Wirescope 350 also makes testing either single mode or multi mode optical fiber installs a simple process via the optional Fiber Smartprobe adapters. Combined test results are integrated inside the same database and its possible to include all the data into a single, easily read report. Reporting is a breeze with the available Pro Scopedata software. With complex cable testing standards becoming more commonplace, clients appreciate the professionally designed reports that clearly that and accurately demonstrate the test results in an simple to understand manner. These reports are easily customizable allowing use of the customer’s graphics and information throughout the report. This gives a truly impressive , professional presentation. Pro Scopedata software can be found here. ● LAN Cabling ranging up to Category 6 TIA is certifiable . Also Class E Standard ISO. The Agilent Wirescope 350 tester is no longer manufactured new but readily available second hand at good savings. This entry was posted in Site News and tagged Agilent Wirescope 350. Bookmark the permalink.